After a visit to Marcia Harrer Sobek, DDS you will leave with a healthy mouth and a smile on your face. Her office provides a comfortable, personalized dental experience. Dr. Harrer Sobek enjoys getting to know each individual patient and provides the highest quality of care alongside her seasoned team. Born in Chicago, IL, Dr. Marcia Harrer Sobek moved to Scottsdale, AZ at the young age of seven. Her childhood dream was to become a well-regarded dentist in her community, inspired by her childhood dentist. She attended Scottsdale High School, received her undergraduate degree at The University of Arizona, and attended dental school at the University of California, San Francisco. She then completed a residency in hospital dentistry at Northwestern University in Chicago. With her dental course-work completed, she was happy to move back to Arizona to establish herself in private practice. Dr. Harrer Sobek focuses on family and cosmetic dentistry and accommodates patients of all ages and needs. Her office provides routine preventive cleanings and examinations, restorative dentistry including implant restoration, and complete cosmetic treatments. Dr. Harrer Sobek and her husband, David, are the parents of Madeline and Grant. When time permits, she pursues her passion for music by playing the flute and piano. 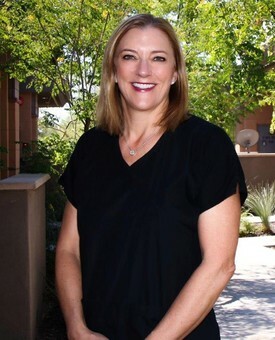 Her professional affiliations include membership in the American Dental Association, the Arizona State Dental Association and its’ component societies, the Seattle Study Club, the Scottsdale-Paradise Valley Study Club, the Junior League of Phoenix, Boys Team Charity, and National Charity League. She and her team also enjoy providing dental services to the community, including their annual participation in the Arizona Mission of Mercy event.